The Evidenza collection from Longines is characterized by stainless steel or gold tonneau cases. 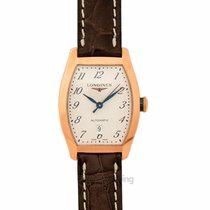 Watches from this line are perfect for men and women who treasure an elegant retro look. Longines first introduced the Evidenza line in 2003. It's a classic dress watch that goes best with a suit for formal business events or visits to the opera or theater. An Evidenza stands out thanks to its tonneau case, which is a prominent feature of this line. It's paired with a retro design reminiscent of the Roaring Twenties. Cases come in stainless steel or rose gold in various sizes. Some older versions were also made of yellow gold. The larger watches are powered by mechanical calibers, while the smaller women's watches are quartz-powered. Which Evidenza should I buy? 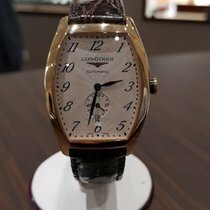 If you want something different than a standard round watch and are looking for a beautiful, yet conservative Art Deco watch, then Longines' Evidenza is a good choice. You don't have to break the bank to purchase a timepiece in this series, either; they're all in a relatively affordable price range. Versions with gold cases , such as the three-hand men's watch (reference number L2.642.8.73.4) have quite a prestigious look. The 18-karat rose gold case measures 38.75 x 33.1 mm, and Longines pairs it with a brown crocodile leather strap. The watch's hands are blued and a small seconds subdial is at six o'clock with a date display window. Cursive Arabic numerals on the dial emphasize the classic look of this timepiece, which costs around 5,000 euros new. A new rose gold Evidenza with a chronograph caliber, black dial, and Roman numerals (L2.643.8.51.4) costs around 7,000 euros. However, this model is no longer part of the current series. The same is true for the yellow gold version (L2.643.6.73.2), which also costs around 7,000 euros on the vintage market. The 30.6 x 26 mm women's watch (L2.155.8.71.2) is powered by an affordable quartz movement. 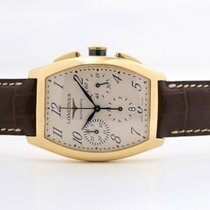 The case, however, is made of rose gold, raising the price of this watch to around 3,000 euros. A relatively large chronograph version of the Evidenza, measuring 40 x 34.9 mm, is available for significantly less thanks to its stainless steel case. The men's watch with a brown alligator leather strap can be found via reference number L2.643.4.73.4 and costs around 1,600 euros. It has blued hands and italicized Arabic numerals as hour indices on a silver dial. If you prefer a stainless steel bracelet to a leather strap, take a look at the watch with reference number L2.643.4.73.6; it costs a bit over 2,000 euros. The version with reference number L2.642.4.51.4 features a black dial with white Roman numerals. Its stainless steel case measures 38.75 x 33.1 mm, making it a mid-sized men's watch, and Longines pairs it with a brown alligator leather strap. You should be prepared to pay around 1,500 euros for a new version of this timepiece. Somewhat smaller is the three-hand Evidenza with reference number L2.342.4.73.6. Its stainless steel case measures 35.6 x 30.5 mm and features a matching stainless steel bracelet. There's a date window located at six o'clock on the silver dial. This unisex timepiece costs around 1,500 euros. A comparable, yet more decorative, variant measures 30.6 x 26 mm and can be found via the reference number L2.142.4.73.6. The smallest watch in the series has dimensions of 23.3 x 19.6 mm, making it the ideal size for a women's watch. Its case and bracelet are made of stainless steel, and its distinctive feature is the presence of 22 diamonds surrounding the dial. The version with reference number L2.175.0.71.6 costs around 1,700 euros; the diamonds are to thank for its higher price tag. Mechanical movements made for Longines by the world's largest ébauche manufacturer, ETA SA Manufacture Horlogère Suisse (ETA) power the watches in this collection. Longines' L650 chronograph caliber is a modified version of the ETA 2894; it features a 42-hour power reserve and vibrates at 28,800 A/h. The caliber L615 , based on the ETA 2895, distinguishes itself by its small seconds and date display. Even the quartz watches powering the women's watches are from the same manufacturer: The L178 is based on the ETA 980.153, while the L152 is based on the ETA 256.111. Generally, the Evidenza is waterproof to 30 m (3 bar), although that means it's only splash proof; you should not go swimming or participate in water sports with this watch on your wrist.The Evidenza line is an alternative to significantly more expensive tonneau watches, such as Patek Philippe's Gondolo or the Cartier Roadster.